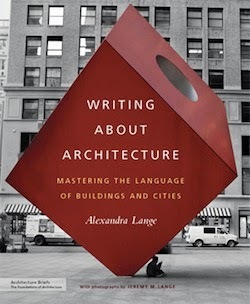 I have been waiting to read Alexandra Lange's Writing About Architecture for a long time. I have read almost all the reviews that I could find on the book published through the internet; one of my favorites was at the ‘A Weekly Dose of Architecture’ by John Hill, which can be found in here. After reading the book, it still remains to be the best source to get a glimpse of what’s inside. In many reviews and book descriptions it has been pointed out that the book consists of six chapters: beginning with an article by a known architectural critic followed by Lange's review and ending with 3 or 4 questions to summarize or bullet point each chapter. Lange’s selection of articles provides the opportunity to scroll through different era critics within a hundred year span, as well as through different gender point of views. I am a Turkish architect and my first language is not English. Thus, it is a challenge to read any kind of a criticism not written in Turkish. I almost always start with a doubt that I will miss something. Thanks to Lange’s selection, all main articles, her own writings as well as other critic’s excerptions within the book are all understandable and very clear even to a foreign reader. Except for, Bilbao, all buildings or neighborhoods mentioned are within the USA. Considering Bilbao for being an American architect’s building, and including an American critic's article, it can be assumed that this case is also within the context of the others. Although I believe it is essential for one to see and experience a work of architecture for one to fully understand it, Lange’s successful selection with the excellent narratives in the book, one can make connections with their own surroundings. I believe this is to be a big achievement. In our formation to become an architect, we have learnt most to criticize works of others. I believe most of us architects think that we all can do this (which may be true to a point). To do it in a proper and a useful way is something else! I believe a proper criticism gives the opportunity for the criticized as well as to the reader to be a better architect. Through different opinions, the reader is equipped with different tools for different approaches; looking through different glasses provides the reader with different perspectives. In Turkey, practicing architects or academicians usually do architectural criticism, due to this reason we have been in lack of proper architectural criticism for a long time. We do not have continuous columns in newspapers or in architectural magazines. When looking around, one can definitely see the lack of it. With many ongoing regeneration projects, our neighborhoods are being turned into lifeless concrete blocks and our parks are being turned into vast voids. The lack of diversity in voices, leaves the city and the people with stand alone buildings: buildings in which people become strangers to themselves and to the nature. Before reading the book, I had the thought that it should be translated to Turkish, so that it would provide insight to real architectural criticism. After reading the book, I think differently. Anybody who can understand and who has the will, should read it in its original language. Through different critics and Lange’s approach it will lead you to find your own words in your own language. If anybody wants to write or read architectural criticism, the book is a great guideline. It can show the reader the way of different critics, observations, quotes, and questions. In the age of regenerations and signature buildings, I hope this book will be a guide for anybody who wants to raise her/his voice for their own surroundings.